President Obama's 2010 budget proposes $105 million for two new federal prisons. The new budget will also add $3 billion to the Department of Justice budget from 2008 figures, putting 50,000 more cops on the payroll. That might be necessary since he continues to bailout billionaires and millionaires, while allowing more homeowners to become homeless. Though only comprising 5% of the world's population, the US jails more citizens, in raw numbers and as a percent, than any other nation on the planet. 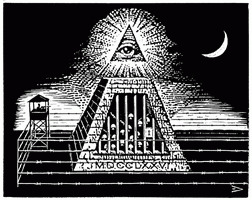 Obama proposes to jail another 3,000 citizens, devoting scarce dollars to the prison industrial complex. The US convicts people of color at rates far above those for whites, and for longer terms. In 2006, the incarceration rate per 100,000 for whites was 409, and 2,468 for blacks. That's an imprisonment rate of nearly 3 in 100 for blacks, or six times higher than for whites. With the federal government's war on drug users, women now comprise a growing portion of those imprisoned. In 1925, the US jailed one in 100,000 women; in 2006, the US jailed one in 746 women. Under Obama's proposed federal prison budget, West Virginia will take the remaining $55 million for a new federal prison.